Interested in camping at the Great Wall? Here's what we have coming up! If you'd like to see all the other hikes and trips we have scheduled, click here for the list of all our upcoming hikes and trips in Beijing. Hike the Great Wall and camp in a tower on this two day Great Wall adventure. We’ll take care of the heavy lifting and have the camping gear delivered direct to our campsite; you’ll just need to carry your clothes, water, and food and snacks. Enjoy the scenery, sunset, stars, and sunrise without all the sweat involved in a full-on camping expedition. We’ll supply the camping equipment, water, snacks, and main meals; bring your camera and get ready to enjoy yourself! Maximum group size of 10 hikers; book early to make sure you get a spot! Take a relatively relaxed hike along the wild Great Wall and camp in a scenic spot on the wall on this Great Wall overnighter. We’ll take care of the heavy lifting and have the camping gear delivered direct to our campsite; you’ll be free to enjoy the scenery, sunset, stars, and sunrise without all the sweat involved in a full-on camping expedition – on this trip we’ll be taking it slow and easy. Interested to see what it's like on one of our Great Wall camping trips? Read through a selection of our trip reports. We headed out to Huairou District to go camping on the Great Wall, and this time we made it one of the type of trips where you need to carry all the gear yourself. 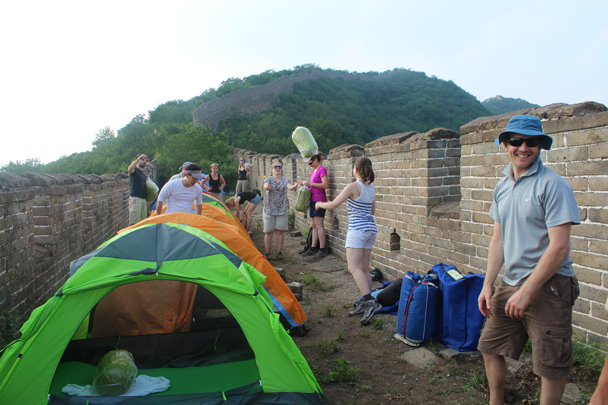 Click through to see photos of the Great Wall and our camping team. With the temperatures warming up a little earlier this year we thought it was time to start our camping trips again. The temperatures dipped in the week before the trip, and we were a little concerned it was going to be freezing up on the wall. Click through to see photos from the camping trip – Great Wall, the sunset, sunrise, and more! Photos from our May holiday camping trip at the Great Wall Spur. Click through to see shots of villages, green hills, Great Wall, and our campsite! Big Camp Plate is the name of a tiny village in Hebei Province, and it’s surrounded by a loop of old Great Wall – great for hiking, with some superb views from high up in the mountains. Click through to see photos of the hikers, the Great Wall, and our little campsite! The Gubeikou to Jinshanling Great Wall hike can be easily done in one day, but it’s also fun to take it more slowly. We took two days to do it, camping overnight at a nice spot right beside the Great Wall. We took a few photos along the way; click through for a look! In late April we did a two-day trip on which we set up camp on an unrestored section of the Great Wall that we call the Switchback. Click through to see nine photos of the Great Wall, our campsite, and happy hikers. Our Big Camp Plate Great Wall hike takes us over Beijing’s border and into the hills of Hebei Province. We walked a section of Great Wall that loops around the village of Big Camp Plate, and as we were walking through the village on the way back to the bus we were invited in for a look at one of the little houses – click through to see photos of the Great Wall, hikers, and what was cooking in the village house. This backpacking trip along the Great Wall took us into Hebei Province, where we followed the Wall between Big Camp Plate Village and Chenjiapu Village. We carried all of our food and gear, including tents, sleeping bags, clothes, and stoves, on our backs for the two-day trip. Click through to see some photos! You're viewing all our Great Wall Camping hikes. We've got many more hikes for you to try, though!